For the next fifty years Reid embraced many art forms. He gradually explored his rich Haida cultural heritage, studying early ethnographic publications, museum collections, and surviving examples of strong works from Haida Gwaii, always trying to understand the logic behind the form. Inspired by the deeply carved messages of the totems and the lush beauty of the Queen Charlottes, Reid would go on to create many powerful sculptural masterpieces. “The Raven and the First Men”, a native version of the birth of mankind, and “The Spirit of Haida Gwaii”, showcased at the Canadian Embassy in Washington, brought international acclaim. 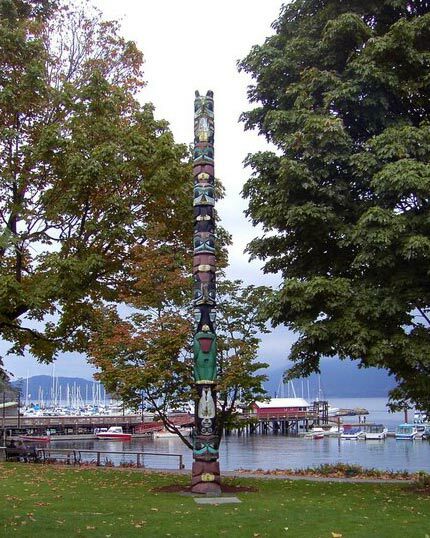 But his crowning achievement was “Lootaas” (“Wave Eater”) — a 15-metre war canoe carved from a single cedar log. Reid both celebrated and defended the Haida, using his fame to champion their land claims. When he died in 1998, the Haida took him home, bringing his remains back to his mother’s ancestral village, Tanu, aboard “Lootaas”. Reid created over 1500 works over his long career, from the ‘monumentally small’ to the ‘exquisitely huge’. In addition, and perhaps of greater impact were his parallel careers as broadcaster, writer, poet, storyteller and communicator. Bill Reid (1920-1998), acclaimed Haida master goldsmith, carver, sculptor, writer and spokesman, was one of Canada’s greatest artists. ** Thanks to the Bill Reid Foundation for this in-depth bio.